The State Commissioner of Police in Abia State has said anybody holding the Biafra flag is to be arrested by the police hencforth. Making this known in Umuahia while parading some suspected members of the outlawed Indigenous People of Biafra, the state Commissioner of Police Anthony Ogbizi said anybody found with the Biafra flag will be arrested. 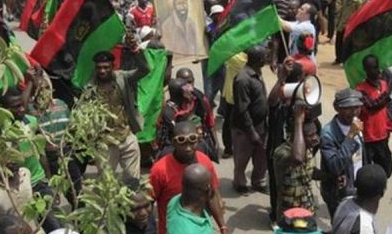 The new Abia police commissioner warned that anyone found with the Biafra emblem will be arrested and charged to court because the proscription of the group by the governors of the south east automatically make it illegal. Ogbizi said it has become illegal for anyone to operate under the IPOB which was declared a terrorist organization by the Nigerian military or adorn its emblems.